The second essay in The Interregnum is called ‘Speech and Silence in the Public Sphere’ by Andrew Dean. It recounts the story of the abuse copped by Eleanor Catton in the wake of her criticism of the direction the county was taking in 2015, and how this is indicative of deteriorating levels of public discourse. Although most of the essay is devoted to quoting Philip Catton, which makes one wonder why Professor Catton didn’t write the essay himself, it aptly summarises the state of the cultural wars in New Zealand and in the West. The narrative of neoliberalism is triumphant; its victims are marginalised because their suffering goes against this narrative. I was in Philip Catton’s History of Science class at the University of Canterbury in the year 2000. It’s curious to think about what the professor teaching that class 100 years from now will say about our time, and about the quality of our public discourse. Dean is right: our public discourse has degenerated to a shameful level, even as the Internet has theoretically made it easier than ever to share science, knowledge and truth. Catton and Dean both have a point when they say that inequality has made the level of discourse more degenerate. The greater the inequality in a society, the more criticism of it is dismissed as “whinging” by those at the top and their lackeys in the mainstream media. Furthermore, the greater the inequality the more society becomes stratified into subgroups that speak their own dialect, so that it becomes difficult to communicate between different positions on the hierarchy. The worse any one group of people is doing, the less their voices fit the neoliberal narrative that “Everything is better than ever, so spend spend spend!” And so, the more their voices are silenced by a mainstream media that is beholden to the same capitalist interests who support neoliberalism. Dean refers to the same pattern that Dan McGlashan calls the “general disenfranchisement rule” in the demographic analysis Understanding New Zealand. It’s a feedback loop in which increasing inequality causes the people in the lower socioeconomic demographics to lose faith in the belief that the system represents them at all, which leads to a decreased turnout rate in elections, which leads to a system that represents them even less, leading to a further decreased rate and so on. He also mentions the effect that neoliberalism had has on the discourse at our universities. Instead of acting as the conscience of the nation, our universities have to compete for students in order to get funding, which means that they have to present a certain image. In the case of New Zealand universities, which get a lot of international students from Asia, it is almost impossible to have a public discussion about the need for cannabis law reform. All in all, this essay is pleasingly accurate and concise, and ends by pointing out that not only it is necessary to point out the failings of neoliberalism it is also getting harder to do because of the silencing of dissenting voices to the mainstream narrative. 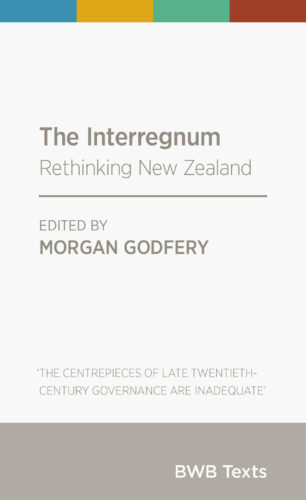 The Interregnum: Rethinking New Zealand is a small book of essays that is for sale at the Volume bookstore in Nelson, by Bridget Williams Books. The blurb on the back asks the question of whether New Zealand’s political settlement is beginning to fray, and purports to “interrogate” the future from a youth perspective. The first essay, by editor Morgan Godfery, is called “The Voices of A New Generation” and opens by relating an anti-TPPA demonstration in Auckland. It breathlessly describes the excitement of thousands of diverse people coming together to oppose the signing of the multilateral trade agreement. Reading this piece, something about it speaks to the lack of purpose that the young generation now has. The fight against apartheid seemed meaningful at the time; it seemed a great evil was being fought. A law that says that a large section of the population are second-class humans, for no other reason than skin colour, seems like the sort of arbitrary and cruel treatment that everyone should be against. But can the same be said of international trade? Who really understands it well enough to decide? And so what if “trade agreements are signed”? By the fourth page of this essay there is already a Marx quote, which bodes poorly. The reader gets the sentiment that the new voice here is going to be an echo of the same social justice warriors seen overseas. If not, why oppose something as vague and nebulous as the TPPA, instead of protesting about poor wages, poor housing, poor mental health outcomes? The essay finds its feet when it hones in on the real enemy: neoliberalism. Godfery mentions the damage done to the national psyche by the Mother of All Budgets, and it feels like he speaks for many when he says that the children condemned to poverty by Richardson’s Budget are now adults, some of us with our own children. But again, this speaks to the confusion in the New Zealand Left. What to make of the fact that the signing of the TPPA was protested under a National Government, with many prominent Labour supporters in attendance, and then the Labour Government went and signed it anyway? No-one knows yet if Labour will get criticised for their evident support of neoliberalism, or whether people will let it pass. This introductory essay declares that the book is for those who have “a fierce desire to radically reshape politics.” It proposes that instead of focusing on “returns on investment”, that we return to a politics of “higher principles and values”. This is all very well, but the question that strikes one is: whose higher principles and values? Because usually when the working class votes for people promising to govern by higher principles, it turns out that those principles only apply to a chosen few groups, and if you’re not one of them then you’re “privileged” (“privileged” means “untermensch” in social justice speak”. We can see this now with Jacinda Ardern’s decision to give Manus Island “refugees” her highest priority, while saying nothing about the Kiwis suffering from the illegal status of medicinal cannabis. Unfortunately for medicinal cannabis users, official victim status has so far eluded them, and so they continue to be ignored. Concluding with half a dozen mentions of the word “love”, this essay promises that the book will make for interesting reading for the sake of political philosophy. However, it’s not possible to believe that a book that opens by quoting several Marxists could be entirely trustworthy or honest, even if it is earnest. It remains to see what these higher principles are. 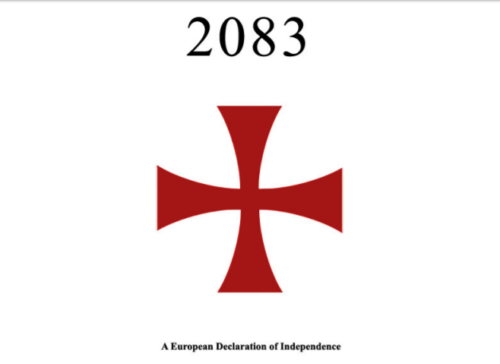 This reading is the final one in this section, and completes our reading of 2083: A Declaration of European Independence. It carries on from here. This final section of the document (pages 1414-end) is mostly given over to a diary-style account that Breivik wrote when he was planning his operation. It describes in detail his thoughts leading up to the event and the caution he took in order to go undetected until the final moment. It reads eerily because of a combination of a few things, especially the ordinariness of the vast majority of Breivik’s thoughts when contrasted with the murderous intent and fanatical devotion with which his deed was planned. Hannah Arendt’s comment about “the banality of evil” comes frequently to mind. Most of the concerns and anxieties that he describes here are simply everyday concerns. One passage about the tediousness of email farming could have been written by any non-violent person, and another passage about Breivik being forced to overcome his fear of spiders might even be endearing if the reader hadn’t already gone through 1,450 pages of justification for shooting teenagers. This section is actually capable of being self-consciously dark and comical, such as when Breivik is describing the difficulties he initially encountered trying to buy black market firearms in Prague, when his typically Norwegian frankness brought instant paranoia to the criminals he was trying to do business with. All in all, it’s things like this that make this document so unsettling. Breivik is clearly capable of sophisticated humour and was apparently able to make friends and socialise without anyone realising what he was planning. With his references to social competition and a great future ambition he seems unbelievably normal – most of the friends he references have serious girlfriends and/or professional jobs. This is a common sentiment for people who have known serial killers and the like, and were astonished by how normal they seemed. After all, Breivik killed over 70 people, which is more than other infamous killers like Ted Bundy and John Wayne Gacy. So it’s reasonable that many people would be surprised and astonished when they saw on the news that someone they knew and considered normal did such a thing. A question about gun control is raised in this section. If Breivik purchased a semi-automatic rifle legally under stringent Norwegian gun control laws, and still managed to kill more people in one incident than has ever been managed by an American terrorist in the entire duration of that country and its long love affair with firearms, then what’s really going on? At one point, Breivik relates a discussion with a Marxist friend at a party, where Breivik asks: “Don’t you consider yourself to be a hypocrite considering the fact that you support mass Muslims immigration and at the same time refuse to actually live with them?” It’s a question that many young Western people have asked themselves of the middle-class left. If a person would start to read this manifesto with a certain idea in their head about Breivik being a neo-Nazi and Nazis being simple but emotional people, they would get a completely different idea by the finish. Breivik is genuine when he claims to despise Nazis, for the reason that Nazis would soon get rid of people like him, a “cultural conservative” who considers Israel a brother nation. Breivik is not a Nazi, and neither is he a thug. There are grammatical errors characteristic of a native Scandinavian speaker throughout the text, but at the same time there are few people who would be capable of compiling a mostly coherent 1,500 page document in a foreign language. Also striking is the fact that Breivik made over $1 million over the course of five year through a variety of entrepreneurial schemes that would have taken good intelligence and great personal drive and commitment to complete. This paints a picture of Breivik as a member of the class elite in many ways. He was physically, financially, socially and intellectually (to say he was ‘mentally’ healthy would be pushing it) in excellent shape. Perhaps here the signs of his downfall can be first observed – in one passage he describes himself as someone with “basically the perfect body”, and at no point in this document does he express an appreciation of or reverence for any other person, apart from vague historical figures. Also telling is the fact that no romantic engagement with a woman is ever mentioned. Breivik mentions partying with Norwegian friends and their girlfriends, but at no point does he mention a girlfriend himself, a desire for a girlfriend, or getting laid (beyond the need to breed children to counter Muslim rates of breeding). It’s possible that his narcissism made him lonely on account of making him intolerable to women. When all the signs are put together, Breivik is clearly a monstrous narcissist, which is perhaps from where he got the willpower to reject the socially accepted history and modes of thinking and arrive at an intelligent and accurate conclusion. It’s perhaps also possible that being one of the few people in his social circles to appreciate the iron-cast logic of Muslims eventually becoming a majority in some European countries if current trends continue, Breivik suffered from a profound sense of alienation and isolation. It’s an extremely difficult experience to be the one person who can see the truth while the masses rip you down for speaking it. This may have caused him to become bitter, resentful and vengeful. In the final analysis, it’s more than possible to put aside the narcissism and the murders and to consider Breivik’s unusual perspective on its own merits. Dismissing this document on the grounds that a murderous narcissist wanted it read is to fall victim to precisely the kind of logic dismantled in the document itself. It would represent the intellectual cowardice that gives rise to someone like Breivik in the first place. After all, Breivik’s political complaints are entirely reasonable, even if his conclusions are not. The real danger is that people with entirely reasonable conservative beliefs are radicalised into violence on account of the utter refusal of the left to engage with them civilly in favour of adopting “Punch a Nazi” style thuggery. A refusal to honestly talk will lead to violence, so any leftist with an honest sense of duty to keep peace and good order in society has to at least consider this question. This is the end of this segment of VJMP Reads. Now we have put to the readers on our FaceBook page the question of which book to read next. In this section (pages 1294-1413), Breivik describes what he predicts will happen when a European civil war kicks off, sometime around 2070 A.D. Chillingly, he is clear about his belief that democracy has already failed. He points out that if Europe is to remain a democracy then it is already lost, because demography has already gone so far as to shift the power into Muslim hands. After all, if Muslims become a numerical majority anywhere then it is no longer a matter of fighting – they will be able to simply vote any aspect of Islamic culture into law. It is a curious fact of the modern public discourse that few commentators are willing to speak about what will happen if current demographic trends continue, even though the historical example of Lebanon has been clearly described by many, not just Breivik. A particularly odd paranoid streak, common in European nationalists, comes through in this section when Breivik lists the crimes of the American Empire. This list is not as exhaustive as his list of the crimes of Islam, but it emphasises a point that is not easy for people in the New World to understand: namely, that the idea of “The West” is a New World concept and European nationalists are quite happy thinking of Europe by itself as a self-sufficient system. Interestingly, here Breivik puts a precise monetary value on his willingness to get rid of Muslims. He states that, when the inevitable deportations begin, every Muslim will be offered 1kg of solid gold to voluntarily go away. $15 billion Euros to get rid of a population of 1 million is a fine exchange in his mind. The plans for a cultural conservative revolution here are comprehensive. Breivik writes about the need to reform education so that children are taught that Islam is a hate ideology on par with Nazism. Re-educated is the preferred method for dealing with Marxists, unless of course they are “Category A, B or C traitors”. Again underlining Breivik’s inability to understand irony, he writes “Crusading is not just a right, but a duty according to Canon Law,” which is precisely the mentality that he is accusing Islam of and which he uses to justify his action. Much like the jihadists he excoriates, Breivik claims that “in the context” of the Islamic invasion of Europe, any action could be considered self-defence, echoing Osama Bin Laden’s justification for the 9/11 bombings. This section then takes a rather bizarre turn, with a series of cut-and-pastes on religious themes such as the ability of the Christian cross to act as a unifying symbol for all Europeans, how the Lord demands that his followers be warriors, and a fire and brimstone laden spiel about the hell that awaits atheists after death. Here Breivik mentions explicitly that he considers himself a warrior of Christ and that if he is killed in action he expects to get into the Christian heaven as a martyr. This section finishes with a c.50 page “interview” with himself, in which Breivik responds to anticipated criticism. Here he again expresses his disdain for Nazism, calling it a “hate ideology” and saying that he could expect the Nazis to turn on conservatives like him as soon as the Marxists were dealt with. Breivik makes a very compelling argument here. The Marxists claim to oppose Nazism on the grounds that declaring a person to be subhuman and then treating them as such is grossly immoral, yet anyone who doesn’t agree with the Marxist doctrine on every point, no matter how evidently ludicrous and self-defeating, is themselves treated as subhuman. Already the Austrian Government is putting elderly ladies in prison for the utterly preposterous non-crime of “Holocaust denial”. It’s hard not to appreciate the accuracy of this criticism of the Left’s behaviour. In this section (pages 1235-1290), Breivik turns to the question of how to consolidate and organise European conservative groups. This is mostly to be achieved through the promulgation of what Breivik calls the “Vienna School” of ideology, so named because it was in Vienna where the last great expression of a European will to not be ruled by Islam took place. For Anglo readers, some of Breivik’s philosophy will appear very curious. Some of this originality is a consequence of being European, such as his desire to resist “excessive US cultural influence”. He also believes in the idea of partitioning South Africa in two countries, with one for the Europeans. These sentiments he shares with many other European thinkers, not all of whom are right-wing. 1. National Socialism (anti-Jewish hate ideology, racist in nature). 2. Islam (anti-Kafr hate ideology, Christians, Jews, Buddhists, Hindus, Atheists etc). 4. Multiculturalism (anti-European hate ideology, anti-white racism). Sometimes Breivik’s argumentation is so reasonable that one is forced to consider whether or not he may have become demented after composing this document. For instance, he correctly points out that it isn’t a good or honourable idea to fight the hate of multiculturalism with the hate of Nazism, and one ought to strive to find an ideology without hate. He also points out that young people should not be considered “lost causes” just because the media labels them racists, a level of tolerance severely at odds with his infamous actions. Much of this section is taken up with talk about the “seven fronts” of peaceful activism, which involve ways of promoting a cultural conservative message and resisting the hate ideologies of Communism and Multiculturalism while acting within the law at all times, and how people in these fronts must officially deny support for the “eighth front” of armed resistance. Breivik gives a sense of having left no stone unturned when he writes at length about the reality of time in prison for anyone really interested in being a member of the eighth front. How to conduct oneself in prison in order to undermine Islam is discussed at length. The most interesting thing to take away from this section is the question Breivik raises when he talks about the need for reasonable cultural conservative movements. He makes the claim that multiculturalists have sown the seeds for their own downfall by making moderate cultural conservatism impossible, because this has driven a large number of impressionable young people into the embrace of hate ideologies like Nazism. This might be the aspect of Breivik’s philosophy that people will have the most difficulty understanding. He has the historical understanding to foresee a counter-reaction to leftism, and he knows that the greater the excesses of one age, the greater the excesses of the counter-reaction. So he is a voice of moderation in a very real way, somehow managing to be a centrist on the paranoid and aggressive axis. Interestingly, however, Breivik puts the responsibility of creating this reasonable cultural conservative movement on his readers. He argues that any unwillingness to do so will inevitably result in impressionable youth having their social needs met by more insidious movements. In this section (pages 1153-1234), Breivik gives his thoughts on the Knights Templar and ethnocentricism. The ultimate goal appears to be the institution of a cultural conservative society akin to that of Japan or South Korea, or what Breivik believes Europe to have been like in the 1950s. Again, an element of paranoia comes through in Breivik’s writings, evidenced through extremely cynical conclusions to otherwise intelligent paths of reasoning. He correctly notes that the Nazi loss in World War II made any nationalist or racial conservative sentiments start to look a bit dangerous, and that this gave the initiative in the culture wars to the Marxists, but it’s not necessarily true that what happened to the West was due to some nefarious master plan. It’s more likely to be simple superstition – such a thing happens to the ideology of the losers of every war. Despite the paranoia, Breivik’s cold Nordic honesty shines through as some points, such as when he concedes that the Marxists have up until now been better propagandists than the cultural conservatives. Although Breivik decries Nazism as a hate ideology at many points in this document, this section, if read in isolation, could easily give the reader the impression he was a racial supremacist. He decries what he believes to be an attempt by the cultural Marxists to cause the extinction of the Nordic genotype on the grounds that this genotype is evil, and he justifies an ethnostate on the basis that one would preserve the indigenous rights of the European people in the face of high Muslim breeding rates. At some points, Breivik’s argument shows a distinct lack of deeper coherence. At one point he correctly points out that women like Pamela Anderson, Gwyneth Paltrow, Scarlett Johansson and Taylor Swift attained fame due to their distinctively Nordic appearance, but the fact that this is true is evidence against a global media conspiracy to exterminate the Nordic genotype. Why would a media conspiracy put forward the Nordic genotype as a beauty standard when they could put forward an Asian or an African genotype and convince white men to ignore their women? If the media puts the Nordic look forward as a beauty ideal this will simply shift the pressure of sexual selection to favour Nordic people, which means that the Nordic genotype would reproduce at a higher rate than it otherwise would have done. The Nordic genotype is not really faced with extinction. People of Nordic genotypes control 30 million square kilometres of territory across Europe, North America and Australia and number close to 400 million (USA 180 million, Germany 75 million, Britain 55 million, Canada 20 million, Low Countries 25 million, Scandinavia 20 million, Australia and New Zealand 20 million). Their combined economic output is three times the closest competitor (either the Japanese or the Han Chinese). Any idea that Breivik is a neo-Nazi can be decisively put to bed when he writes that “If there is one historical figure and past Germanic leader I hate it is Adolf Hitler.” However, he concedes that there is a 60% overlap between his ideal policy and that of the Nazis. In a passage about sexual morality, Breivik writes “Approximately 50% of my female friends end up under the definition/category; promiscuous (female sluts) as they have engaged in sexual activity with more than 20 partners…” This sort of lifestyle was not for him, however, despite that “I could easily have chosen the same path if I wanted to, due to my looks, status, resourcefulness and charm.” This invites one to wonder how Breivik would have turned out if someone had given him some MDMA at age 18 or so. Curiously, there is a passage where Breivik writes about the need to use “reprogenetics” to create a race of humans free from hereditary diseases in which he sounds very similar to the megalomaniacal Sigurd Mastersen in The Verity Key. Breivik wants to use women in third-world countries as surrogate mothers for embryos engineered to create a child of the Nordic genotype. Further underlying Breivik’s inability to comprehend irony, he writes in one passage about the dangers of hip hop and how the lyrics can easily lead to a destructive and anti-authoritarian attitude. Well, it’s apparent that Breivik himself fulfills the criteria of having a destructive and anti-authoritarian attitude. Notably, Breivik writes that “I never tried drugs myself as I never wanted to break that threshold.” Perhaps if he had been willing to try some drugs he would have broken out of the paranoid, obsessive, repetitive thought-loops of vengeance and justice that led him to kill over 70 people. In this section (pages 1068-1152), Breivik writes about a wide variety of topics, including a proposal for a merit system for the society of knights, how to counter state propaganda, an entreaty to European police forces and an argument for the reinstitution of patriarchy. Again without apparent irony, Breivik writes that “[The media] deliberately portray us as the anti-thesis of the ideal person so that we achieve a minimum of impact when it comes to appealing to the average European.” This is a curious position if it is considered that the average European, being rather civilised, generally finds murderers unappealing. It’s obvious from reading a document such as this one that a person with Breivik’s mind was clearly capable of carrying out the deeds he was accused of. But it’s hard to know what to make of someone who advises prospective mass killers to “Visit a male salon if possible and apply light makeup” before taking photos of themselves in order to look the best. Here Breivik gives a very interesting explanation for the phenomenon of the mainstream media describing white mass shooters as “lone wolves” or “mentally unstable”: ultimately, the Establishment wants to avoid having to explain why there is an ideological opposition to the way they are running things, because having to explain this would give that opposition the perception of legitimacy. This explains why ruling classes of all times and places are so quick to decry their opponents as “mad” – because it delegitimises them. Yet again, Breivik decries Nazism: “We hate everything Nazi Germany stood for, in fact we view the current EUSSR/Multiculturalist regimes of Western Europe as totalitarian Nazi regimes.” It’s apparent that there will always be people who call him a neo-Nazi, but anyone who has bothered to read this document knows that this isn’t true. The most difficult thing for most readers of this document to understand will be Breivik’s frequently declared opposition to “all hate-ideologies; communism, cultural Marxism/multiculturalism, Islam and national socialism.” Most people tend to assume that any mass shooter belongs to a hate ideology and will therefore have considerable difficulty putting Breivik in a box. Also difficult to understand is Breivik’s frank acknowledgement of the success of Islam in honouring those who have martyred themselves for its cause. Perhaps this has occurred out of Breivik’s will to approach the question of nationalism from a military perspective. When Breivik writes that “It is every Europeans duty to defend their people and country against the ideology of genocide, conquest and destruction known as Islam,” this raises a number of questions. Some of these questions are fair, but many will resist asking them for fear of granting legitimacy to violent nationalist sentiments. The biggest is this: how do we know that Islam is not an ideology of conquest? Because the only thing stopping more people from following Breivik’s line of reasoning is the pervasive belief that Islam is not an ideology of conquest. If this belief does not accord with reality then it will eventually yield. This is no trivial point. The fact remains that if a large number of fighting-age men come into your territory with an ideology of conquest then you are literally at war, no matter how much you might deny it or want it not be true. Who decided that these “refugees” came to Europe with a long-term will to peacefully integrate? Who is even qualified to decide such things, and, if no-one really is, how can it have happened? Certainly if the millions of Muslims who are currently in Europe decide that they don’t want to peacefully integrate – and the experience from everywhere else is that they don’t – then letting them in in such numbers was a catastrophic strategic error from the perspective of European leaders tasked with maintaining the quality of life of their people. It might be a problem that takes a century or more to solve. Perhaps it’s not unreasonable to declare these leaders traitors? Interestingly, Breivik explicitly mentions in this section the fact that attitudes to Jews make it extremely difficult for European nationalist sentiments to unify around a common goal. On the one hand are neo-Nazis, who consider Jews the enemy; on the other hand are Christian conservatives, who consider the Jews a common ally against Islam. At the end of this section, Breivik underlines the strength of his identification with Christianity, making the argument that only the Catholic Church can unite and speak for all Europeans and that conservative Christian governments ought to reflect this in their policy. In all, it’s clear that the Establishment is, and must be, very uncertain about how to respond to someone like Breivik. They appear to have mostly decided to make the subject of him and his ideas taboo (which is, of course, a red rag to those of us at VJM Publishing), but this strategy is doomed to fail because of the increasing pressure brought about by the political trends mentioned in this document. In this section (pages 949-1067), Breivik continues to evaluate strategies and tactics for terrorist acts. Chillingly, here he writes specifically about the benefits of targeting a party conference of social democrats, for the reason that security will probably be poor, as well as expounding on why this would be so excellent a propaganda move for the cultural conservatives. This section continues the high detail discussion about how to best carry about a terror attack. Given the comprehensive nature of the rest of the document when it comes to listing Islamic crimes, one is left with the impression that an extreme amount of thought went into the planning for the massacre that Breivik did carry out. There is something grimly medieval about mutilating living people to let them serve as a reminder of what befalls traitors, and this section is much darker and more demented than the sections about history. One is reminded of the admonition not to lose one’s own humanity in the course of warfare. Again the paranoid nature of the rest of the document shines through when Breivik writes, of the largest annual conference of Norwegian investigative journalists, “98% of them are considered quality category B traitor targets”. With a worldview like this, Breivik could justify killing almost anyone. Unsettlingly for us at VJM Publishing, this explicitly includes us – “90%+ of [writers] support multiculturalism and usually portray their world view through their works.” So we would also be marked for death if Breivik had his way, as those who work in the arts and recreational services tend to have broadly leftist sympathies. The descriptions of how to break out from being pinned down by Police forces during an operation read like Breivik is writing about a video game. One passage describes how a car can be stolen and driven through any cordon that the first wave of Police officers might set up. This gives the impression that Breivik must have spent countless hours in dark plotting and fantasising. Breivik emphasises in this section the need to keep “civilian” casualties at a minimum. By this, of course, he means people who are not leftists. One is further reminded of the paranoid and oppositional nature of the document. It is also grandiose, which comes through in passages such as the description of how to blow up a nuclear reactor for the sake of financial damage to the “mutilculturalist regime”. An unappreciated irony, at least on Breivik’s part, is that the document repeatedly emphasises how important it is that any prospective “operative” avoid getting flagged by the domestic security and intelligence services, yet it is possession of this document itself, with its voluminous advice for how to carry out terror attacks, which is most likely to get a person flagged by said spooks. In this section (pages 848-948), Breivik talks about the details of actually planning a terrorist attack. These hundred pages are very detailed and it is easy for the reader to feel a chilling sense of the ruthlessness with which Breivik carried out his own operation. Opening with the quote “Violence is the mother of change”, this section is as comprehensive as any of the previous ones. It goes into considerable detail in advising would-be terrorists how to keep their intentions a secret from their fellows. For example, there are several pages devoted specifically to the advantages in pretending to have a World of Warcraft addiction when it comes to explaining away the avoidance of social occasions, and pretending to be gay is given as a good strategy for deflecting intrusive questions. Ironically, the document references the success of Muslim terrorists at several points during this section, in particular when Breivik is talking about the need to maintain psychological discipline and motivation, and how the very same psychological straitjacket that Breivik despises is so effective when it comes to guerrilla warfare. Keeping with the same vein of the earlier parts of the document, this section goes into bemusing levels of details when it comes to planning an operation. There is an exhaustive account of all the considerations necessary for putting together a suit of ballistic armour that would resist even rifle fire. This section also covers the use of steroids to achieve the maximum physical ability to carry out a terror attack, as well as the use of ephedrine, caffeine and aspirin stacks. No detail is too trivial to be added here, which underlines the degree that Breivik was serious about action. Perhaps the strangest part of this document is the passage relating to the possibility of using like-minded white nationalist or national socialist contacts to secure weaponry. Here Breivik takes care to point out that these groups are likely to view the potential operative as hostile if they learn that he is pro-Israel. This passage more than any other speaks to the self-imposed social isolation that was necessary for Breivik to carry out the actions he did. In a passage that is reminiscent of the reasoning of Charles Manson, Breivik talks about targeting Muslim women out of the specific hope that male relatives will swear revenge against the people of Europe and thereby create a continent-wide race war. Further underlying the isolation that Breivik found himself in, his list of prime targets for terror operations consist of the political parties that he considers to be Cultural Marxists. These lists contain almost every party in the Parliament of every country. In this section (c. pages 776-847), titled “A Declaration of Pre-emptive War”, Breivik discusses how “Christian/conservative/nationalist” forces can organise themselves to best resist the coming chaos. Here he is particular about making sure that the work is seen as hypothetical and fictional, apparently for the reason that he is concerned about potential legal consequences from being too explicit. Here also he holds European politicians accountable for every single crime committed by Muslims in Europe, a crime rate that he describes as “an average 1000 atrocities per 100 000 Muslims annually.” The line of reasoning Breivik pursues here is that, without Muslims being in Europe, none of these crimes would ever have happened. This is perhaps the most untenable of all the claims in this document. Although it’s literally true that none of the crimes committed by Muslims against Europeans would have happened if there were no Muslims in Europe, the absolute numbers of crimes in a particular country is primarily a function of the absolute numbers of people – after all, America manages to maintain an extremely high rate of crime (by developed world standards) with far fewer Muslims than Europe. Breivik tends to conflate all genuine criticism of European traditions and institutions into the category of the great Marxist/feminist conspiracy against Europe. He does this with the nature of the Church’s influence on European society – here Breivik can not tolerate any criticism of the Church on libertarian or humanist grounds. All criticism of the Church is a Marxist plot to destroy Europe. The paranoid nature of some of the earlier parts of the document resurfaces when Breivik details a media-led conspiracy to deny the truth about historical Islamic violence. This also misses the mark. The media doesn’t educate anyone, ever – it sells advertising. Breivik considers it a kind of bias for the media to be silent on, for example, the genocide of Hindus and Buddhists in the Hindu Kush, but that degree of historical detail is reserved for special and academic interests, not for a mainstream media which speaks to a twelve-year old intellect. The legal measures suggested in this section are those that Breivik appears to believe should be instituted by any genuinely patriotic European front, should any take power. Curiously, one of the policy points allows for the immediate release of all “patriotically-minded” individuals from Western European jails. Perhaps Breivik himself, incarcerated as he is for life, is counting on such a policy in order to get out of jail himself. When he writes that “Norway and Sweden are two of the world’s most repressive Marxist regimes,” he echoes a sentiment that is common among Scandinavian conservatives, especially Christian ones. This sentiment is grounded in a disbelief that the conservatives are in a genuine minority. Where majority opinion does not agree (and it’s far from agreeing with Breivik’s demands that all Muslims be deported on pain of execution), this is considered evidence of brainwashing. Interestingly, Breivik lists all of Communism, Cultural Marxism, Islam and Nazism as “hate ideologies” which must be opposed by any European male who wishes to be accepted into what he hopes might become a renewed European chivalric order. It’s apparent that anyone who thinks like this in contemporary European society is bound to experience a certain degree of social isolation. This might ultimately help to explain the reasoning that led Breivik to take the actions he did.